In the 115-page judgement delivered by Justice Prithviraj K Chavan and N M Jamdar on Friday stopping the mining transportation has come down heavily over the State Government for patting mining companies and ignoring the mining affected people in the State of Goa. Judges even referred other public interest litigations related to the mining dependents and pointed out shoddy approach of State Government, which is clearly mentioned in this judgement copy. “Why we refer to it, is because simultaneously we are hearing other public interest litigations in respect of the mining affected villages. These villages have suffered severe air pollution due to mining, the natural streams have been polluted and dried up and many do not have water to drink. In these petition, there was absolute lack of any response from the State. At first there were simple denials that problem is not serious. We had to pass series of orders over a period of four months just to ensure that the State takes steps to provide drinking water to these villages”, the extract from May 4 order read. 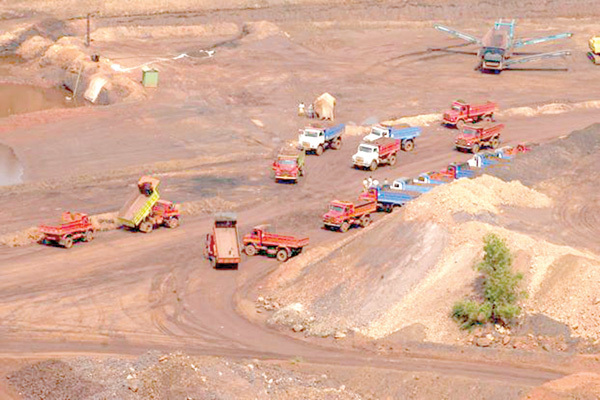 Court has said in its order that the Rs 180 crores were collected by the State of Goa in last two years in District Mineral Fund for the mining affected, but not even single rupee was spent and the foundations were established after court passed the orders and their first meeting was held just last month. “We had to literally push the State on every date to do something to alleviate the suffering of the innocent mining affected. This sharp contrast in the State response in respect of these two ends of mining spectrum, the Mining Affected and the Mining Beneficiaries, is too stark for us not to notice”, HC said in its order. Court categorically stated before writing down direction that, “We write it here because it pains our conscience” (page 1). High Court has observed that State Government order of March 21, 2018 just two months after the Supreme Court in its order had severely castigated the State for siding with the mining companies at the cost of health and well being of Goans and at the cost of the environment. “When the highest Court passed strictures, it was meant as a wakeup call for the State as how it should approach the issues surrounding mineral wealth in the State. These observations taken as guidance for further conduct, the State of Goa should not sacrifice maximising revenue for no apparent positive reason, and surrender itself to the commercial and profit making motives of private entrepreneurs and ignoring the interests of Goan society in general”, the judgement read. After the strictures, the Supreme Court expected the State to act as a guardian of the mineral resources and that the State would take a proactive stand ensuring that the mining owners wind up all their operations by March 15, 2018, HC said while pressing that State would have approached SC. “State is not a private party to expect detailed directions to be issued to it, but it is enough for the State, when a broader policy is indicated, to take a cue. If the State had any doubt, appropriate course of action would have been made to move the Apex Court for clarification”, the order read. The Court further said that the State should not be a party to the avariciousness of the mining lease holders who are motivated by profits to be made through the exploitation of natural resources. The State should have considerations for the people of Goa and its fragile ecology and not for the mining lease holders alone, the health of the average Goan should be a priority, it states. “Enforcing the Rule of Law, addressing the concerns of the citizens of Goa and following the orders of the Supreme Court, are more important than just focusing on earning revenue alone”, High Court said. Why State didn’t move Supreme Court? Court observed that the State Government was an uncertainty over the matter as per the records placed on the record in the court and said that moving to Supreme Court was an option before Government but they dint do. “One of the options open to the State Government in the circumstances was to move the Supreme Court for necessary modification/ clarification, since the order was passed under Article 142. It was possible for the Respondents (mining companies) to seek extension of five weeks period. None of this was done, at least we are not informed of any such applications”, HC order read. The High Court coming over the arguments made by the respondents that includes State of Goa by interpreting the order of Supreme Court has said that they (HC) consider that the Supreme Court was aware that when judgment was delivered on February 7, 2018 mining operations, including excavation, were going on. The Supreme Court was aware that the moment the judgment is pronounced, half way excavation activities could cease, instant the judgment is delivered, court said. Supreme Court exercised its power under Article 142 to permit mining operations, without which the time granted to arrange the affairs would have been of no effect, High Court said. “Thus, the liberty granted to carry out mining operations till March 15, 2018 was just a component of larger indulgence given by the Supreme Court to arrange the affairs within five weeks. But this was not a charter to continue excavation as if nothing was wrong. This limited charter was given only to ensure that the mining leaseholders are able to arrange their affairs within five weeks”, HC said. HC said that the State was expected to monitor the complete phasing out, to ensure that the mining companies will manage their affairs within five weeks. It further stated that the State should have issued a mandate that though the Supreme Court has used the words 'mining operations', it is only for winding up and not for full fledged mining activity, because basically such activity was illegal and is allowed only as an indulgence. The Court said that the State chose to confer a complete and unfettered right on the mining companies instead of wrapping the activities by March 15, 2018. “In our respectful reading of the judgment, and looking at the jurisprudence it invokes, we are of the respectful opinion that the Supreme Court did not permit such course of action”, the order read. It is submitted in the court that the Government of Goa has no manpower, machinery and technical experts to carry out the activities of safety in need. It is stated that lease holders who were granted right over the land can continue safety operations. Goa Foundation has taken exception to keep the mining leaseholders as in-charge of safety operations, on the ground that they cannot be permitted to be kept in-charge having no right. GF has prayed to direct the Director of Mine Safety, Indian Bureau of Mines and the Director of Mines to take steps to take safety measure in view of the oncoming monsoon season. Further submitted before court that there is no clarify as to who is responsible for the safety of the mines and the people adjacent to the mines. “The State Government has simply thrown up its hand stating that it does not have the machinery, equipments or personnel to take care of the mines. The Director General of Mines Safety has stated that it is the responsibility of the State Government”, Court said. The Court said that the Indian Bureau of Mines, the Director General of Mines Safety, Goa and Chief Secretary should hold an immediate meeting with the concerned Officers and draw a plan of action in respect of the safety measures in the light of the coming monsoon. Court has also asked the Chief Secretary to invite the necessary senior officers from the Police Department, Department of Forests, Department of Revenue, etc to take collective decision in the matter. Supreme Court in its February 7 judgment quashed and set aside the second renewals granted to 88 mining leases while directing them to stop operations after March 15. Accordingly, DMG ordered stoppage of all mining operations including transportation of ore from March 16. However, through an order dated March 21, it allowed transportation of ore, for which royalty is paid and was lying outside the lease areas, before March 15. The Bombay High Court at Goa through its judgment on Friday has set aside the State government’s March 21 order. As per the information available, from March 16 to May 3, the leaseholders were involved in transportation of 48,785.93 tonnes (0.048 million tons) of ore from plots to jetties. The leaseholders like Fomento Resources Pvt Ltd, Minescape and Kedar Ores Pvt Ltd, Minescape Minerals Pvt Ltd, Timblo Pvt Ltd, Goldwin Ferro Alloys Pvt Ltd, etc. From February 7 to March 15, total 6.137 million tons of ore is transported, while the fresh production is 2.25 million tonnes. Currently, 3.10 million tonnes of ore is lying at jetties, plants and plots all together. While there is another 5.17 million tonnes of ore lying on the leases. With so much of ore lying outside and inside the lease area, the High Court has granted four weeks time to the State Government to decide on the ownership rights as a custodian of the mineral resources and its powers to take possession, sell and dispose of the ore in question to utilise the proceeds for public purpose.